Need for Speed Undercover has been released and is now available on iTunes store for $9.99. 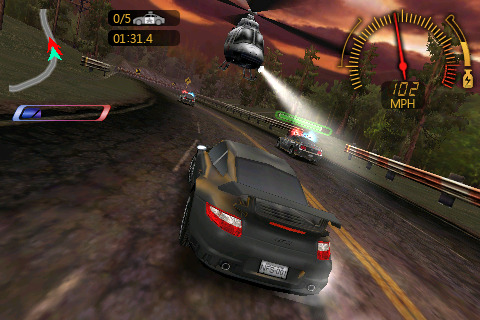 â€¢ Eight different race modes including Highway Battle, Sprint, and Cop Takeout. â€¢ Atermarket body-kits, wheels, spoilers and paint jobs. That doesn't look bad actually. This is what I call a good iPhone game. I can only compare it to Ferrari GT as its the only other racing game on my ipod touch and I could say its FAR better in terms of graphics and gameplay. the cut scenes from the console/PC counterparts are here. It now depends on the length of the game to see if its worth it or not (hopefully in the rage of a DS/PSP). I tried this game, took like 1.5 hours to download it through the schools network, and it's the best racing game on an iPhone. "Looks really Good, but unfortunately I do not have I phone => ONLY Mobile Phone!" How can I get something out of my ipod shuffle headphone jack? I have an ipod shuffle. I recently broke my dock by standing on it. When I tried to put the ipod onto the dock, a piece of the headphone jack broke off inside the ipod and it's stuck inside. Is there a way I can get it out?